Whether you’re just starting to learn to cook or just don’t have the energy to plan and shop for your own meals every week, a meal kit delivery service is a convenient way to make cooking at home easier. A meal delivery service can also be a great way to experiment with new flavors and recipes you might not have thought to try on your own. If you’re interested in trying one of the best meal delivery kit services, consider trying Blue Apron. Read our full Blue Apron review to see if this is the best meal kit delivery service for you. Blue Apron has the widest variety of globally inspired recipes compared to other meal delivery services and has been around the longest. In fact, this service was one of the first meal delivery services to hit the market. Blue Apron believes that our food growth and distribution system is complicated, making finding the best food for your family can be difficult. To resolve that, Blue Apron partners with farmers to get high-quality ingredients and using distribution systems that are good for the environment and our bodies. About two-thirds of the recipes from Blue Apron are modeled after ethnic cuisines, while only about one-third are more traditional American comfort food style. You can select from recipes from different cultures such as Greek, Asian, Mediterranean and Mexican inspired flavors. Blue Apron also promises to never send you the same recipe twice in the same year unless you request that meal again. 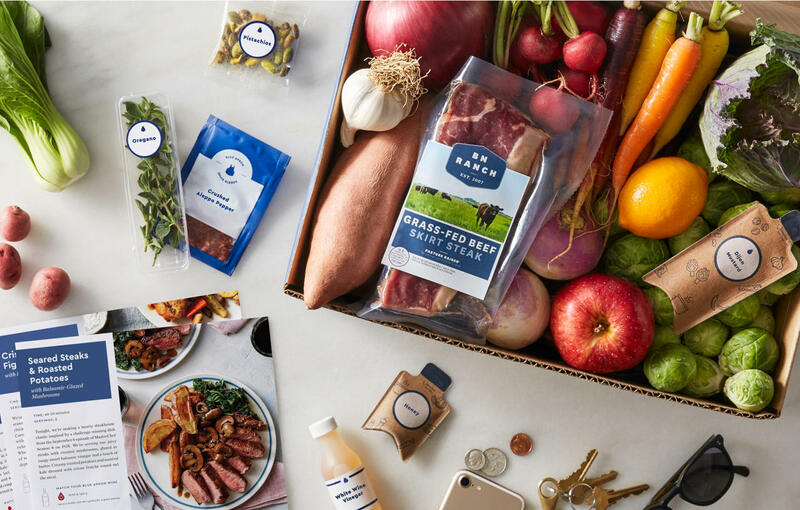 According to a Consumer Reports taste test, Blue Apron didn’t score the highest when it came to flavor compared to other meal delivery services. However, recipes were all rated as either “good” or “very good,” and this meal delivery service has a long history of satisfied customers. The category Blue Apron did come out on top in was the price. Blue Apron is an affordable meal kit compared to other services like Hello Fresh and Plated. Individual servings in a family plan can go as low as $7.49 a serving. That’s almost $5 less per serving than Plated. Many Blue Apron reviews talk about how the value for the price is outstanding. Blue Apron is also the only meal delivery service we reviewed that offers the option of including a wine subscription. Similar to their recipes, each wine comes with a card that breaks down the notes, flavors and recommendations on which recipes to pair it with. You’ll also learn the story behind each wine, how it was produced and how to taste it the right way. Wines are chosen to complement the recipes you chose in your delivery box. The wine options is a great service to use when you’re cooking for a small dinner party or a special occasion. Hearty portions: Some meal delivery kits offer small portions than you might prefer. Blue Apron provides big portions when compared to other services. 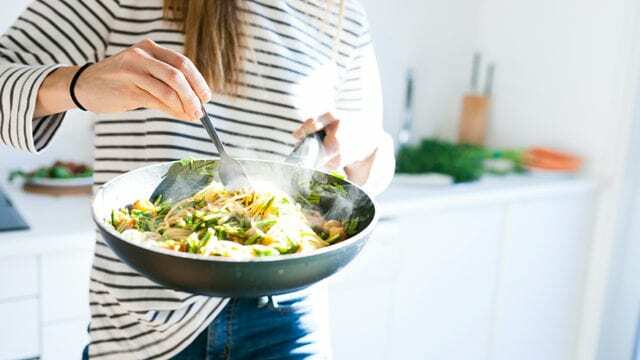 Inexpensive: cost per serving: Although Blue Apron isn’t as cheap as some of the meal kits dedicated primarily to low cost, this service offers a great cost per serving while you still enjoy the high-quality ingredients and recipes. Specialty diet options: On a diet? Don’t worry. Blue Apron often has options that are compatible with various diets. Widest variety of global cuisines: Some other meal kit services provide globally inspired recipes every now and then, but Blue Apron is the best service if you regularly want to enjoy food from a variety of places. Wine pairing subscription service: If you love wine or would like to learn more about pairing wine with your recipes, the wine subscription is perfect for you. Didn’t win flavor scores: When Consumer Reports checked the flavor, Blue Apron didn’t score higher than other services, although most people did rate the meals as having good flavor. Ingredient quality: While the ingredients are good-quality, they often aren’t superior. Long prep times: Some recipes take up to an hour to prepare. Other services promise that meals will take 30 minutes or less to prepare. Nutritional information isn’t listed directly on recipe cards: If you want to see the nutritional details, you’ll need to go to the website or look at the separate card. However, Blue Apron does list the ingredient list, nutritional information, allergens and daily values up to a week and a half in advance. 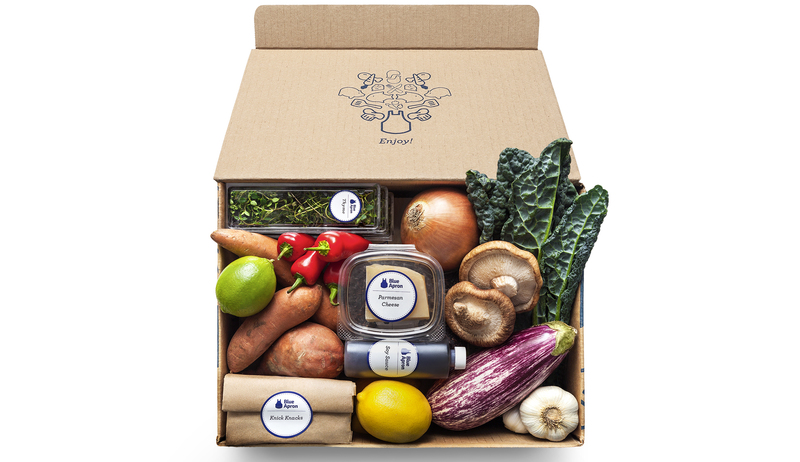 Blue Apron sources fresh, seasonal ingredients from farms, importers and family-run food providers. Blue Apron uses small-batch artisans to source ingredients like pasta and tortillas. 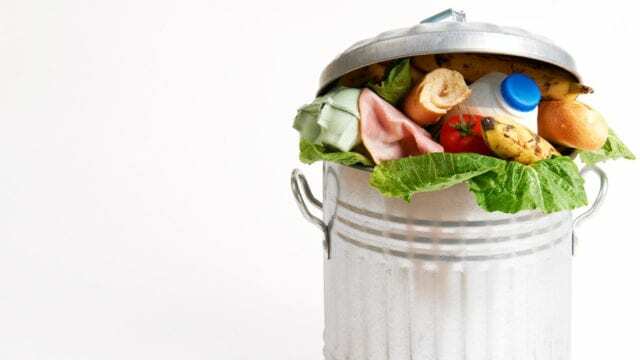 Ingredients are mostly locally sourced and delivered in pre-portioned quantities to reduce food waste. Meats are antibiotic and hormone free. The majority of beef is from grass-fed cows and the seafood is sustainably caught, but not wild. While Blue Apron reviews say that the ingredients aren’t always the highest quality, they are still better quality than you might expect. A meal kit box from Blue Apron includes all the ingredients you need to make the recipes you selected for the week. You’ll receive the exact amount of each ingredient you need to make the number of portions you chose. Ingredients are individually packaged in either paper bags, plastic bags or individual containers. Everything is labeled, but ingredients aren’t grouped together by recipes. You’ll have to read through the recipe cards and select the ingredients you need to cook each meal. The ingredients come in a box with insulated packaging and recyclable ice packs. This ensures that everything stays fresh for up to a few hours after delivery. You don’t need to rush home right away to unpack everything, and most Blue Apron reviews say that the food stays fresh as long as it needs to. Like other meal delivery services, there’s no signature required for the carrier to drop off your box. Meats are also vacuum sealed to maintain freshness for up to two weeks. If you want to stay creative in the kitchen or enjoy ethnic flavors more than traditional American meals, Blue Apron is the best meal delivery service to order from. Although the quality of ingredients isn’t as high as Plated, Blue Apron does offer the most innovative recipes. You can choose from eight different recipes every week and the menu is continually updated. A variety of meat, poultry, seafood and vegetarian options are always included. You can preview the following week’s menu ahead of time. You also have the option to include a wine pairing with your weekly recipes! As of now, the main downside to Blue Apron is that it doesn’t offer a lot of options for dietary restrictions. If you want gluten-free or vegan options or you’re worried about food allergies it isn’t the best meal delivery service to use. Blue Apron reviews from people who have diet restrictions say that substitutions are possible, but this service won’t automatically give you recipes catered to your diet needs. Although you can adjust recipes for allergies and food restrictions, everything is packaged in the same facility, so there’s a chance your box could be contaminated. This can be dangerous for anyone with a peanut allergy or another strong allergy. 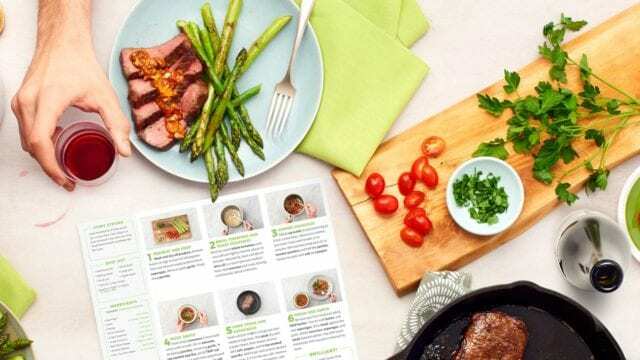 Recipe cards are included in your meal kit box and have step-by-step photo instructions. They’re easy to follow and include pictures of the right way to chop vegetables and meats for each recipe. Blue Apron also has a handy app you can download that has helpful cooking tips in the form of clear instructional videos. You can learn things like the best way to season food as you cook, how to properly salt water and more nutritional information on each ingredient. Unlike other meal delivery services, the nutritional information isn’t on the same card as the cooking instructions. Instead, it’s found on a separate card included in your box. Cook time ranges from 30 minutes to an hour for most recipes. However, time spent cooking and prepping is dependent on how fast you work in the kitchen. Adobe style chicken with sautéed bok choy and jasmine rice. Blue Apron has two main meal plans. A two-person plan and a family plan that includes four servings, although you can customize portions with customer service. The two-person plan delivers two or three recipes per week, and the family plan gives you the option of two, three or four recipes per week. The two-person plan starts at $47.95 per week, and the family plan starts at $71.92 per week. 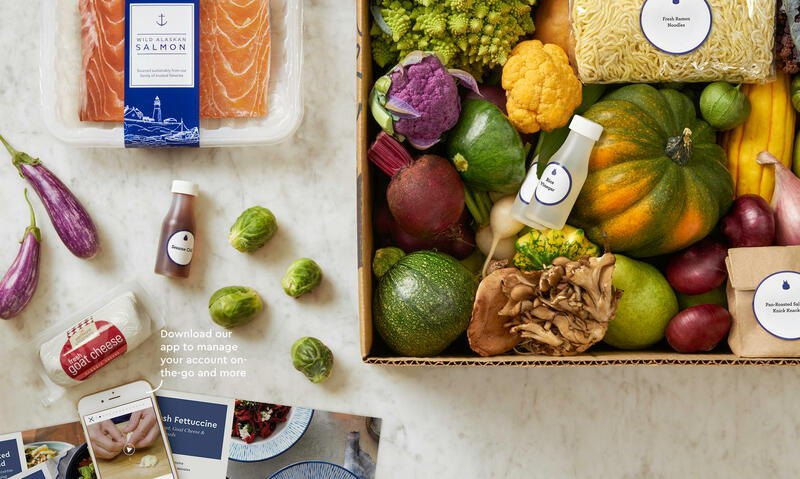 Individual portion prices range from about $7.49 per person to $9.99, making Blue Apron one of the cheaper meal delivery services on the market. 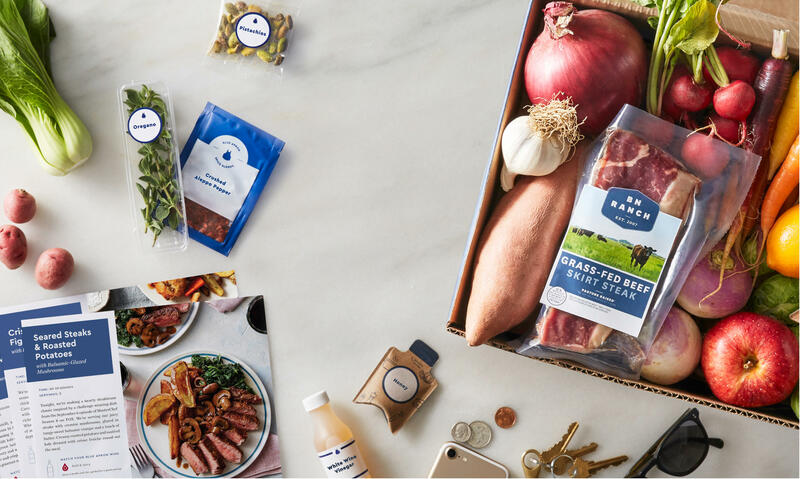 If you’re looking for a flexible subscription plan with a lot of customization options, Blue Apron isn’t your best bet. It is a good service if you want a straight-forward subscription with flavorful recipe options. Because the company only delivers two or three recipes a week on the two-person plan, it’s better used to make cooking easier half the week or balance eating out. You can choose your delivery date and skip a week or cancel any time. Blue Aprons occasionally runs sales that give new customers a discount across their first few orders. Delivery is free with the exception of ordering two recipes a week with the two-person plan. The delivery fee for that plan is $7.99. 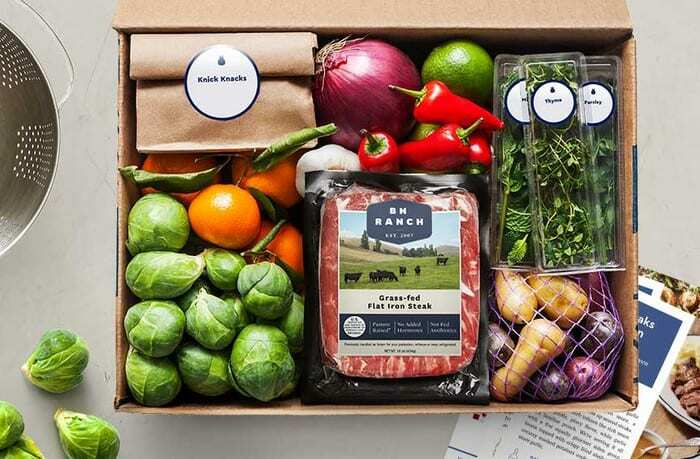 Blue Apron delivers across the United States, but it isn’t available yet everywhere. You can check to see if Blue Apron delivers to you here. If you’re a fan of flavorful, ethnic recipes Blue Apron is a great meal delivery service to try. This is also the best for anyone looking to order from one of the cheapest meal delivery services. The recipes are good, but the quality of ingredients isn’t as high as other services like Plated. Meats and produce aren’t certified organic or non-GMO, but they are fresh and tasty. 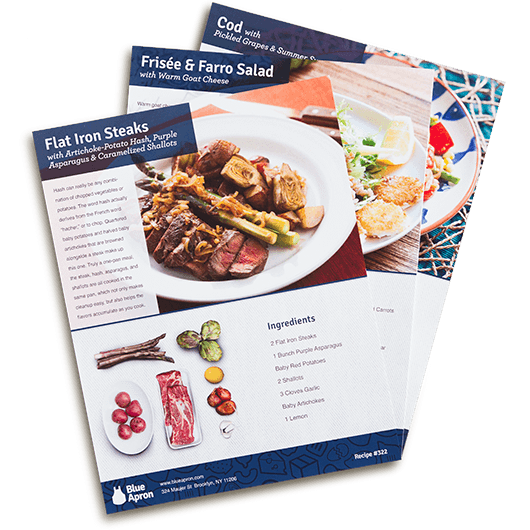 Blue Apron is also best for omnivores and pescatarians. Although Blue Apron offers some delicious vegetarian options every week, it doesn’t offer a lot of vegan or gluten-free recipes. It’s also not a good option if you’re trying to lose weight, cleanse or eat mostly plant-based meals. The calorie count tends to be on the higher side. Other services like Splendid Spoon or Daily Harvest are better for sticking to health goals or dietary restrictions. Overall, we think Blue Apron is a great meal delivery kit option. If this sounds like it’s what your look for, learn more about Blue Apron. Have you tried this meal delivery kit service? If so, leave your own Blue Apron review below.